Many have heard of RPA and have seen presentations or reports extolling its virtues, but it is a completely different experience to see it in action and understand the mechanics of how it truly works. This idea was the driving force behind the concept of the RPA in Action project, a joint effort between Honda, SIG, PeopleTicker, Denali and Symphony Ventures to provide a participatory and educational RPA experience for SIG Global Summit attendees. As a SIG member, Honda was an appealing testbed. “There was a cumbersome, manual, disconnected process with multiple system interfaces required – the perfect setup for RPA,” says Bill Harris, Director of the Strategic Procurement Group at Honda, who accepted the proposal. The challenge to automate a part of their Talent Acquisition processes was on. Symphony was there from the beginning of discussions with Honda, collaboratively shaping the vision of the project. The scope not only had to be challenging, yet feasible, but also comprehensive, yet engaging. 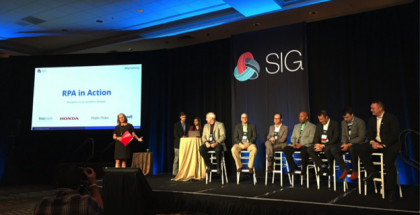 After two full days of work by the US Symphony team at SIG, with overnight support from Symphony’s Robotic Operating Center in Poland, the RPA solution was unveiled on the final day of the SIG Summit. It wowed the 350+ attendees who had gathered to watch it, and the team members involved were pleased as well. The final presentation of the completed RPA solution, presented by Symphony Ventures, accompanied by the project leads of the various stakeholders. As Bill Harris noted, the project started off slowly because it took a while to identify and loop in key stakeholders. Talking to the relevant people early on provides a strong foundation of resources to work from. The key here is to make sure each stakeholder understands what RPA is, and the requirements associated with RPA, so they know what to do and how to support. For Honda and many clients in Symphony’s experience, the people in IT were the ‘gatekeepers’ during implementation. Make sure the IT team is educated on your RPA initiative and are aware of the tasks at hand. Often times, integrating RPA robots into company systems takes more effort and time than expected, so get them prepared early on in the process. Additionally, loop in related divisions like Information Security, to avoid getting held up by any possible concerns later on (perhaps too late) in the process. A successful RPA solution requires constant communication between SMEs and developers. This is why Honda’s Casey Kirk and Bill Harris were closely involved throughout the project. Whether it is mapping out the as-is process or developing the to-be process map, it is imperative to have an expert to verify and sign-off on each component. This will ensure that your working standards are up to par and that the solution is as thorough as possible. Test everything. RPA involves many interconnected systems, operating across various environments. To ensure smooth deployment, align your test and production environments as closely as possible. Then, make sure to be very thorough. You will need extensive exception management testing. Involve SMEs and conduct user acceptance tests. This will mitigate potential errors and facilitate faster adoption of the RPA solution among the personnel involved. When it is time to deploy, make sure you have checked off each of the prerequisites to going live. Communicate with other departments upstream and downstream of the automated process. Involve and educate related functions so they can be prepared to adjust to the new workflow. Finally, consider alternatives to an immediate, full deployment. A gradual or phased deployment could help create a smoother transition from a human workforce to a digital one. After deployment, you should keep up with the automated process to ensure that it aligns to your expectations. Make sure you have a quality plan that outlines the predicted metrics of the project and closely audit the process to find any discrepancies. While at it, look for continuous improvements in the process that could be made. Avoid unanticipated effects by considering the full impact of the RPA solution. If an order entry process drops from taking all day to just a couple hours, then the processes later in the stream will be significantly impacted. You don’t want to end up simply moving a bottleneck from one process to the next. So, look at areas to improve or automate adjacent to the process at hand. This will save you trouble down the road and improve your workflow while at it. Following the steps outlined above, Symphony was able to coordinate key resources across stakeholders to pull together a powerful proof of concept at SIG. The underlying principle is to be prepared before, during, and after any foray into RPA. As a result, you can expand your vision beyond a project-by-project basis, drive holistic transformation and truly embark on the future of work journey. David Brain, COO, Symphony Ventures, is a process and automation expert who has gained recognition as the pre-eminent expert in Robotic Process Automation and was named ‘Consultant of the Year 2016’ by the Global Outsourcing Association for his work in transforming global enterprises through the deployment of automation technologies and methodologies. As COO, David has built, and now continues to lead the global consulting, implementation and managed services teams within Symphony Ventures ensuring flawless solution design and execution on every engagement.